Versatile & Lovely Blogger Awards, Pet Edition | Will My Dog Hate Me? Confession: In the past year and a half, I received a Versatile Blogger award from Jana Rade of DawgBusiness and one from Sharon Castellanos of Grouchy Puppy, as well as a Lovely Blog award from Vera Marie Badertscher of A Traveler’s Library. And I haven’t passed them along. That is VBBK (Very Bad Blog Karma). Thank the person people who gave you the award: Thank you very much Vera Marie, Jana, and Sharon. All evidence to the contrary, I was very moved and appreciative for the recognition. I am in the process of arranging to have a swarm of bees on my roof relocated. Note that the word “relocate” is not a euphemism for “sent to bee heaven.” I don’t want to have ABK (Angry Bee Karma) in addition to VBBK so I am not planning to euphemize my bees. I honeymooned in two of the three Axis of Evil countries, Afghanistan and Iran, and one Cold War enemy, the Soviet Union. In my defense, I was a hippie, they weren’t Axis of Evil countries at the time, and I wanted to visit the Hermitage. I sometimes let Frankie lick my plates and then serve other people from them (after actually washing them). My Ph.D. dissertation was later published as a book, The Collected Poems of Paul Blackburn. Despite this evidence to the contrary, I often dream that I never finished my dissertation or that, because of some technicality, I have to give my Ph.D. back. My office floor is strewn with piles of paper, theoretically en route to file folders that are often mislabeled. I revise everything I write endlessly. This last revelation has been at least 5 different things. In spite of having established a guilt-free zone, I worry that the people I didn’t choose for the awards won’t like me. I assure you, I love many other blogs. I owe all the following bloggers money. I leave it up to the bloggers themselves to decide whether they’re Lovely or Versatile or both (note: If you’re Lovely you don’t have to share seven things about yourself, embarrassing or otherwise). Dancing Dog Blog. Mary Haight brings a wonderful blend of compassion and serious smarts to a blog that is often the bearer of (useful) bad news — pet food recalls, puppy mill busts– but also knows how to have a good time with interviews of small pet business owners, say, and giveaways (my favorite was the monk-made dog biscuits). Go Pet Friendly. Rod and Amy Burkert complement the service part of their pet travel website — which is extremely useful — with a Fetching News blog that often deals with serious issues about traveling with pets, in an engaged, often playful fashion. Great pictures of their road trips, too. Dog Spelled Forward. Eric Goebelbecker tackles dog training issues with a daunting intellect and, at times, righteous anger. And did I mention funny? Champion of My Heart. Roxanne Hawn manages to squeeze a LOT of topics — caring for aging parents, books, relationships — into a blog that has Lilly, a fearful dog, as its center, writing with wit and thoughtfulness. Boulder Dog. Deborah Flick blogs from the heart while putting her moving tales of everyday life with Sadie, her fearful poodle, into a larger context of training theories she’s read about and worked with over time. Dog Jaunt. Mary-Alice Pomputius brings a delightfully geeky (and exemplary) attention to detail to her reviews of travel-related products and dog-friendly transportation. Her site’s got a great new look too. Fido and Wino. Shauna (whose last name I can’t find on her blog) is a sassy Woman with Attitude, endlessly upbeat about rescue without ever crossing the line into (shudder) perky. Her ROAR (Rescue Owners are Rocking) series, well, rocks. FearfulDogs’ Blog. Debbie Jacobs’ assessments of working with fearful dogs is commonsensical, intrepid, earnest, sympathetic — and philosophical. I always learn something about the world from her blog. Hmmm. I seem to read a lot of blogs about fearful dogs. I can’t imagine why. Finally I am going to put my favorite vet bloggers into a single “You don’t have to pass this along because you’re way too busy” category: Dr. V at Pawcurious; Janet Tobiassen Crosby at About.com: Veterinary Medicine; Lorie Huston at The Pet Health Care Gazette; and Shawn Finch at Riley and James Fan Club. Although each has a distinct tone and style, they share a love for animals and the people who care about them. Thank you! Not kidding about the honeymoon. Someday I’ll have to write about that trip, which falls into the “do when you’re young and fearless — not to mention clueless” category. And do you notice that my name is missing a couple of letters at the end? Some programs have decided arbitrarily that my name is too long. The nerve! While you’re reading dog blogs, you might want to follow the antics of the two goldens that live in France at French-Word-a-Day. Re: your name shortening: My blog is taking revenge on your blog which refuses to recognize my blog in commentluv. I am sure it’s incurring more VBBK by taking revenge but it can’t help itself. I will check out the French goldens blog — thank you! Thanks for the award! I had no idea you had a PHD. Gotta watch out for that bee karma. I think it’s a lot more intimidating that blog karma. As Gandalf said, “Do not meddle in the affairs of Bees, for they are subtle and quick to anger.” Or something like that. Righteous anger is in the eye of the beholder. If I disagreed with what you were angry about I’d call you a crank. “Euphemize” the bees? If you hadn’t already earned your offputting PhD, that would have earned you one in the Department of Causing People to Spray Coffee Out of Their Noses. I lmao’d at number 3! We and the dogs use the same dishes. They drink out a glass that looks just like mine, they eat off the same plates we do. I wash them after uses just like I do ours. I will occasionally (when I haven’t seen them do anything gross recently) feed a pup off my own spoon or fork. The children go “ewww” and I remind them I did the same with them and they were grosser and left way more spit to rinse off. At least the dog never drools on me! They are family and I treat them as I would want to be treated. My attitude is that the people who visit me are not nearly as important as my dogs. To them, it’s an animal. To me, they are adopted angels who are short, hairy, walk on all fours and don’t speak clearly. Hey, Frankie speaks a lot more clearly than some of my friends. Not having had children, I can’t attest to the human drool factor, but Frankie is very careful about licking everything clean sans saliva residue. Wait a minute, you mean there are people out there who don’t let their dogs lick their dishes? Who knew? Thank you so much for mentioning me, yeah! I don’t have a PhD so I don’t know what that must feel like… but several years ago a job finder person suggested that I may want to consider taking my master’s off my resume so I could find a job. Wha-? I didn’t. 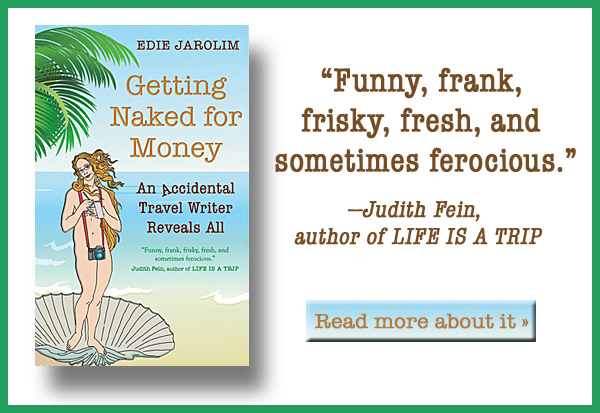 An exclamation point — or two — does not a perky person make!! I did have one publisher ask me if I would be comfortable working for the company’s romance division what with my advance degree and all. I said yes, no problem. What I didn’t say but what has become one of my rules to live by: Having a lit PhD means you can read any crap you like (yes, Kitty Kelly’s Oprah biography) without ever having to say you’re sorry. I’m late to the party, which isn’t surprising considering this week’s various distractions. Thanks for the mention. You’ll have to tell us the honeymoon story sometime. Hey Edie—Thank you. 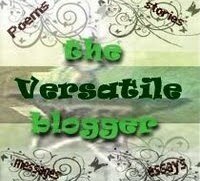 I’m thrilled and honored to be included in your esteemed list of bloggers. It’s 8:30pm in Boulder and I was just stopping by Twitter on my way to putting the finishing touches on my Versatile Blogger Award post when I discovered your tweet. You’re on my list too! But, I don’t think the doggie karma gods will punish you if you don’t offer up another list of 15, unless, of course, you want to. Thank you again. I herewith absolve you of the need to write another 15 too. Unless you want to. Thank you in advance for thinking of me! That did it – bblurb choke cough snort – whoa! Way too close on the nasel thing, let me tell you! And with *soda*, well, that would be ugly! I am certain my neighbors think I am a loon with all this singular hilarity going on…Tashi just stares at me, probably mentally ticking through the list of likely new caretakers! Thanks for the award, Edie, and isn’t it something with these recalls – the blog is filled with them – recent posts stack the deck! Scrubbing it with interviews/reviews so the chi gets back to a semblance of balance! I had no clue about the VBBK, which I am also, oh noooo, infected with. I like the idea of rejiggering the rules however, excellent and I will take it over to my place;-D Thanks again, you are too kind! Sorry about the soda (not really), and about not emphasizing your many reviews/interviews/and other upbeat items (really). it’s kind of gloomy — a lot of rain in the last week — and bee-filled here. But I’m going to go back and change your award because I don’t want people thinking your blog is a downer! Ever. Thanks for dropping by Sugar — your congrats are much appreciated! Edie, thanks so much for including us in your fantastic list. Also, rather than thinking of it as spitting my beverage of choice, I choose to appreciate you for helping me keep my computer screen clean. It seems I frequently have to wipe it off when I’m reading your posts! You’re very welcome, Amy. And while I can’t imagine you spitting — on the screen or elsewhere, which is a good thing — I appreciate the sentiment (and, of course, your willingness to forgive interest on the debt).